a) H.H. Prince (Anak Angga Majas) Naradhama Yuvaksha Duriya [Norodom Yuveakduri]. b. at Phnom Penh, 1962 (s/o Anak Munang Pheup). b) H.H. Prince (Anak Angga Majas) Naradhama Vajiravudha [Norodom Veakchiravouth]. b. at Phnom Penh, 10th January 1966 (s/o Tea Kim Yin), educ. Paier Coll of Art, Hamden, Connecticut, USA (Dip. Graphic Design). Illustrator & Designer on Connecticut Post Newspaper 1994-1997, Art Designer with SFA Marketing Communications Inc since 1996. m. at New Haven, Connecticut, USA, and at the Kantha Bopha Palace, Phnom Penh, 9th July 2001, Anak Munang Elsie Norodom (b. in Malaysia, 5th April 1971), née Elsie Chiu Moan Wah, former wife of Udairaj Aryabino Bipat, and daughter of Chiu Kam Seng, by his wife, Mrs Wong Lai Yeen. c) H.H. Prince (Anak Angga Majas) Naradhama Vajarindra [Norodom Veakcharin]. b. at Phnom Penh, 1969 (s/o Tea Kim Yin). Left behind with his matrnal grandparents when his parents went abroad to Hong Kong in 1970. He was k. by the Khmer Rouges, 1976.
b) H.H. Princess (Anak Angga Majas) Pekina [Norodom Pekina]. b. at Peking, China, 7th July 1970 (d/o Tea Kim Yin), educ. Naugatuck High Sch, Naugatuck, Connecticut, USA. Mngr. with TIMEX Corp. m. at the Khemerin Palace, Phnom Penh, 30th May 2002, Marc Howard Coumeri (b. USA, 1976), educ. Johns Hopkins Univ. (B.Eng. 1997), and Massachucettes Inst. of Technology (MIT) (MSc), employed with American Express International Corp, New York City, son of John J. Coumeri, of New Jersey, USA, by his wife, Linda. c) H.H. Princess (Anak Angga Majas) Naradhama Yuvakshmi Devi [Norodom Yuveaktevi]. b. at Peking, China, 6th September 1974 (d/o Tea Kim Yin), educ. Naugatuck High Sch, Naugatuck, Connecticut, USA. c) H.R.H. 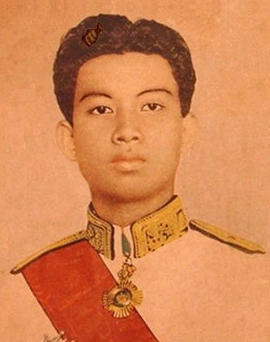 Prince (Brhat Angga Majas) Naradhama Sudiyaridha [Norodom Sotheariddh]. b. 2003 (s/o Phalla). a) H.R.H. Princess (Brhat Angga Majas) Naradhama Ratna Devi [Norodom Radanathev or Rathna Tevi] [Nana]. b. at Aix-en-Provence, France, 18th June 1974. MNA since 2003, Sec of State for Tourism 2004-2007. m. at the Khemarin Palace, Phnom Penh, 31st December 2005, Captain Ansiau Amory Quentin La Planeta, cmsnd as 2nd-Leiut French Marine Forces 1988, rcvd: Knt of the National Order of Merit (10.11.2006), son of Gaston-René La Planeta, of La Goulette and Le Kram, Tunisia, by his wife, Liliane. 3) H.R.H. Prince (Samdach Krum Khun) Naradhama Ravi Varman. b. at the Khemerin Palace, Phnom Penh, 8th July 1944, as Prince (Brhat Angga Majas) Naradhama Ravi Varman [Norodom Rachvivong] (s/o Princess Bangsaramuni). Raised to the posthumous rank of Samdach Krum Khun. He d.s.p. unm. from chronic malaria in the jungles of Cambodia, 31st July 1973. *becoming the fourth, and last of his line, to be invested with the original Imperial insignia awarded to King Norodom I by Emperor Napoléon III in 1872.